20160714 + Up in the am and into work. Incredibly busy fast day. Headed home and had some dinner. L&I hung out on the back porch and talked to D a bit, trying to get him to start thinking more than only 22.13 seconds ahead... D&I relisted some ebay items. 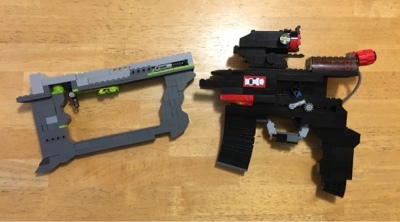 J showed me the LEGO guns he and Conor built last night, pretty cool. Penn stopped over for a beer.